Earlier this month, top-selling Pinoy handset company Cherry Mobile quietly released several new Android handset models targeted at budget-conscious consumers - including students and yuppies - who are finally thinking about upgrading to their first smartphone. 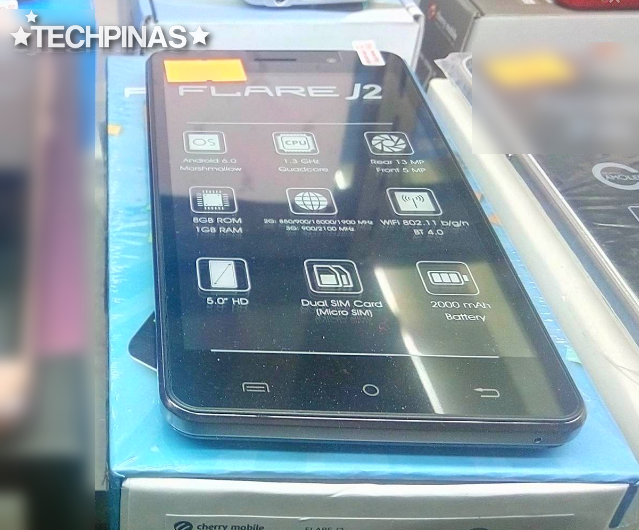 Of the bunch, I find Cherry Mobile Flare J2 particularly interesting. I mean, looking at its specs-sheet and considering the fact that it sells for just Php 2,999, I think it offers great bang for the buck. All photos in this post are courtesy of TP Friend Charles Quiachon who spotted this unit at a CM authorized retail outlet in SM North EDSA CyberZone. In terms of design, there's nothing particularly special about this model. Frankly, it looks rather simple as it lacks lush metallic accents compared to CM's Flare Premium devices. 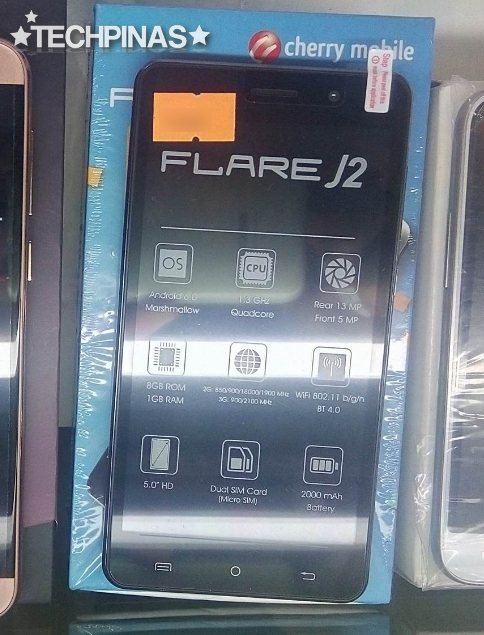 But what makes Flare J2 a true stand-out in its price bracket are its technical specifications. For such a wallet-friendly price, you already get a full-fledged smartphone sporting a 5-inch HD IPS display, 13 MegaPixel autofocus rear camera with LED flash, 5 MegaPixel selfie cam in front, Full HD video recorder, Dual SIM Dual Standby capability (dual microSIM), and 3G HSPA+ mobile connectivity support. I kind of wish its battery capacity was higher than 2,000 mAh but it's given the phone's price tag, it's hard to complain. 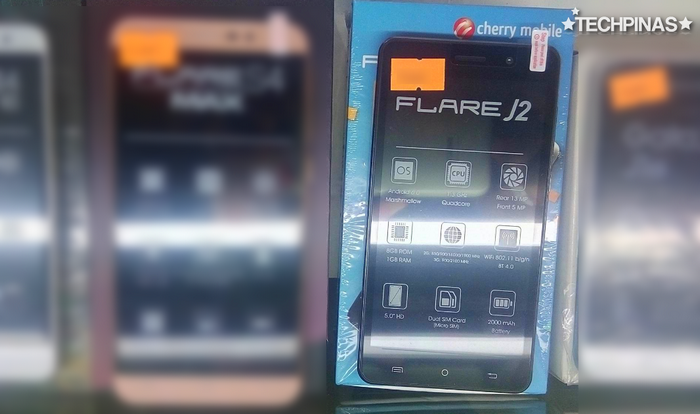 Under the hood, Cherry Mobile Flare J2 runs its Android 6.0 Marshmallow OS with a 1.3 GHz Quad Core MediaTek MT6580 chipset that has four ARM Cortex A7 cores and a Mali 400 MP2 GPU, has 1GB of RAM, and comes with 8GB of expandable storage. Android 6.0 Marshmallow is one of the more updated versions of Google's mobile operating system. Visually, it's very sleek because of its Material design interface. It's also more energy efficient compared to earlier versions of the OS, which results in improved device uptime. This great-bang-for-the-buck back-to-school Android handset is out now at all CM Concept Stores, kiosks, and official retail stores across the country.